NYC, 02/07/2019, 2:00PM. 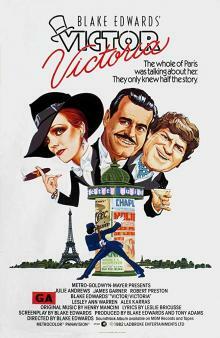 Victor Victoria (1982): Oscar winning musical. 134 min. Director: Blake Edwards. Starring Julie Andrews, James Garner, Robert Preston. The film was adapted in 1995 as a Broadway musical. The film was nominated for seven Academy Awards and won the Academy Award for Best Original Score. It is a remake of the 1933 German film Viktor und Viktoria.